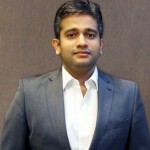 Aditya Bhamidipaty co founded eMart Solutions in 2009. He is an Electronics and Communications Engineer from JNTU Hyderabad and a PGDM from IIM-A. Campus placement took him into P&G, where he learnt a lot about Sales, Marketing and Business Development for 3 years. The urge to start something on his own and to contribute to the country increased in his P&G years. He then got an offer to join iGate in London. Realizing that some overseas exposure would give him expertise and better insights to build a large organization, he accepted the offer. While P&G is a brand that sells for itself, IT services, on the other hand was a commoditized market, that challenged his sales capabilities. At iGate, he learnt the complex enterprise sales process, building customer relationships; differentiating the solution using the right business context and his Customer Business Development background at P&G helped him to understand various business issues of his customers better. He had group of friends who used to ideate on what can be done from an entrepreneurial perspective as all these friends in the group had one common goal – come back and contribute to India. They went through a bunch of ideas and he froze on one and began eMart Solutions along with his school mate Srikanth Chunduri. They knew that the Indian e-commerce digital marketing space was underserved as Internet was taking off in India but with a potential of about 2 million users. They also figured out that India is a Data Paucity country and there is a tremendous opportunity in contributing to this space. They came up with a concept and packed their bags to the Silicon Valley. They presented the concept to a bunch of private investors and raised the first round of seed money. The idea that they presented was in itself such an impactful idea, that they were able to raise money in just a 6 slider presentation. They came back to India in 2008 and launched the company in July 2009. Aditya understood the issues that companies were facing with customer data since he was in Sales and Marketing all along. Enterprises had the customer data at a high level which consisted of total transactions but no one had access to information of who did the transaction and hence the data was not completely useful. Managing excel was a big part of the job description of marketing people whose experience could have been leveraged better by making them do some meaningful data analysis. Loyalty was one of the first areas Aditya went after because this was the key for customer engagement. Aditya had two options; to build the product and take it to the market or to enter the market as a service led company and build the product simultaneously taking feedback from the market. He decided to take the service led route as he knew that the enterprise market was not Do It Yourself friendly and the risk of getting it wrong in a Fully Built out model was high. He decided to build a framework, support it with a managed services model and build the product based on the feedback of the customers who he would be servicing using this framework and it worked. They started in July 2009 and the first 9 months were spent in validating the idea within their own network, which was large. Aditya says that he did Zero marketing for the first two years. They participated at a national forum and were rated as one of the most innovative and promising companies in India. This award and the work they were doing across got them covered by Business Today & Economic Times which gave a good boost to their publicity and enquiries began flowing and all of this was fully organic in nature. The founders personally went to the customers and did the discussions because they were validating their assumptions on their built out framework. By the end of the first year, they had two customers for whom they made the implementation successful. The first two customers became Beach Heads for them and that got them subsequent customers. After two years of the founders selling directly, they set up a Sales team. Later in their journey, the sales team was further structured based on focus Industries, marketing as a separate team came into the picture. This was the team which was now running campaigns for their existing customers and new prospects. They were now specifically focusing on PR and event participation as well. Aditya says that in the initial days known networks definitely open the doors but the product has to stand on its feet and the founder has to close the sale. Every buyer has a charter and they will buy only when the product has an ability to deliver the objectives of their program. No buyer will take a sub-optimal decision if they think that it may be wrong for their brand or for their company. In an enterprise sales situation, there is a matrix of decision makers and there are so many of those. Aditya and the team, in their first few customer situations did go through lots of evaluation in every aspect ranging from who they were, what their ability was and they had to bring in the process and demonstrate the technology. Aditya quotes that the biggest question in the early days was to sell the concept. At that time when he was pitching his solutions for ‘What the enterprises can do with the data’ and explaining them the huge potential that data has, the marketers were still not convinced if they should even capture the data. He says that the biggest win in his early days was the first unknown customer where they knew no one. This happened within the first year as this came in as a customer reference. The warm introduction put them in touch with the top management which otherwise would have taken a few weeks. They landed directly with the purchase team with high recommendations to be evaluated for the purpose. The purchase department evaluated them on the product, fitment to purpose, process, quality, company stability and several other parameters in reference to the existing large vendors’ landscape. Aditya quotes the main reason that worked well in his favor in addition to the product’s uniqueness, was the sales person the customer dealt with – Aditya himself. Being a Founder, he was able to sell the passion, bring energy into the sales process, modify the solutions, take instant decisions which was viewed positive even though they did not score well on parameters like longevity of the company & product, financial stability, past working history to name a few. This is one formula Aditya followed for two years – he went and front ended the sales and the product also evolved better than the competition because of this. The fact that they had two satisfied Fortune 1000 clients as their first two clients allayed the concerns of the new customers that they were a smaller company. One area of improvement that Aditya mentions is the whole structured marketing approach that they started after 3.5 years only to help them. He might not have had the capacity earlier, but after he created the structure, he had seen dramatic improvement to control the sales process and the kind of efficiency. He was not sure if he could have done it earlier, he does not have anything to regret. Aditya’s advice to early stage entrepreneurs – A founder should ensure that the entire company should understand that they have a role to play in sales in the early days. There will be a lot of disconnects, if the internal teams think that it is the job of one team to sell and they don’t need to be a part of it. The founders should also disseminate their vision & idea to the entire sales team hence they would need to spend time to coach the sales teams on the job. The founders go with the sales team and sell so that the team can pick up concepts from customer pitches. eMart Solutions today has around 150 employees. They have 400 plus unique customers of which 35 plus of them are long term contracts spanning years. The quantum of business that relies on them to deliver customer engagement is around INR 12,000 Crores and the total number of shoppers/ consumers using their customer engagement platform is 12 Million. They recently won ‘best use of gamification in a loyalty program’ award in the Loyalty Summit and were rated as one of the most Innovative companies in Red Herring Asia. They have also won lots of awards within their customers’ organizations across the country and Asia Pacific. They have till date raised three rounds of Angel funding.